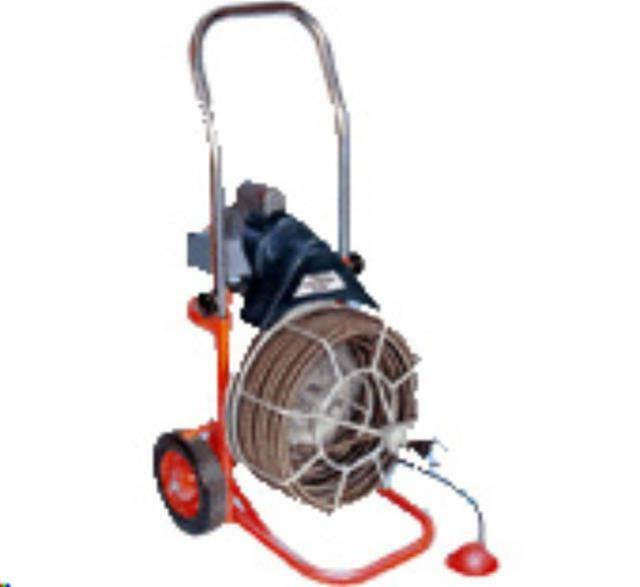 The Mini Rooter drives 50 feet of 1/2" cable, using the same heavy duty motor we use on the Easy Rooter. The machine rolls on eight inch ball bearing wheels and has a wheel brake to lock the machine into position on the job. A quick folding handle makes it easier to load into a car trunk. The cage can be removed in less than a minute. A ground fault circuit interrupter, air activated foot pedal, safety slip clutch, and instructional video are standard equipment. * Please call us with any questions about our drain cleaner 50 foot 2 inch 4 inch mr c o minie rentals serving Princeton, Vincennes, Evansville, Gibson County, and surrounding communities in Southwestern Indiana.